A customer requested to have a capability to get an overview of the effective configured settings for rules / monitors and its values for Windows Computer objects. 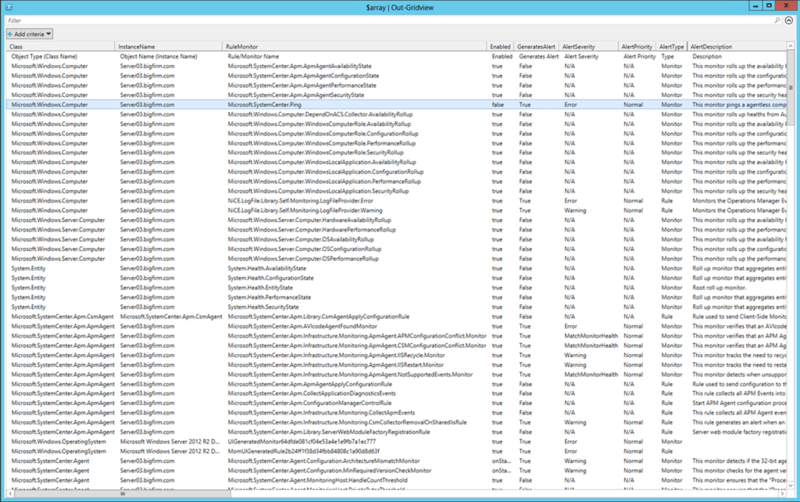 For some administrators browsing through the SCOM console is just too time consuming and / or too complicated. There are not many ways of providing a simple solution to satisfy this requirement, unless you know PowerShell – of course. In PowerShell we have an interesting cmdlet called Export-SCOMEffectiveMonitoringConfiguration. This cmdlet let’s you calculate and export the current effective configuration for a monitored object. This sounds great, but there is a not so cool downside. The export file is a CSV separated by the “|” (pipe) delimiter which makes it a bit hard to handle it with certain cmdlets in PowerShell. As far I have seen, there is no way of changing the default delimiter nor the behavior of the cmdlet. Finally we are dumping the array to the Grid View…. That’s the real way of getting the effective configuration for a monitored computer. The requirements for the script are simple, you just need to have PowerShell and the OperationsManager PowerShell module installed on your client. for example I have a monitor that when created has a default alert severity of warning. The MP in deployed and at some future date this monitor is overridden for one of the computer and the severity is set to critical. If I run the above will it show the value for the above as warning (e.g. the setting from the original MP configuration or will it show critical to reflect that is the live setting for this on the agent? It will show the effective setting of critical for the monitor. Be aware that the script uses a cmdlet for SCOM 2012. You will also see if e.g. a monitor was disabled in the “original” MP and it was enabled at a later point in time, the Setting will show up as enabled. There is custom configuration for rule/monitor the name doesn’t look friendly, for example “MomUIGeneratedRule6d9a17bc90ef492…”. Is that possible to grab the friendly name of the rule/monitor? Numerous problems with Export-SCOMEffectiveMonitoringConfiguration. First were the sql errors due to duplicate writeactions in the cluster MP. that took me many days to find and i ended up fixing it by excluding certain IDs for win 2008 since we use 2008 R2 and i know this woul dnot hurt my data. If i just added top1 as recommended the exported config would be incomplete. Now that its all working w/out error I just get incomplete data from Export-SCOMEffectiveMonitoringConfiguration. For example i run that off a group of web servers. One of them will produce a file half the size as the rest whihc is missing most all monitors. If i check manually via the console gui, neither have failed workflows and they both show same things monitored. Thanks for your update and sharing! I know that there are / were cases where this cmdlet doesn’t work right and I really really hope Microsoft will manage to fix this. Thanks Stefan for this amazing post 🙂 I would like to know how to run this script on a multiple agents or group of servers simultaneously. Is that possible? Please reply. Thanks for this post. Could you please suggest if it is possible to list the ‘management packs’ for hosts ? I would like to see how many management packs downloaded on each host. I am not sure what you mean, could you give an example? sorry..I’m re-phrasing the question. In health explorer, I can see the list of monitors and rules linked to the host, along with that the management pack name as well (in monitor/rule propeties). 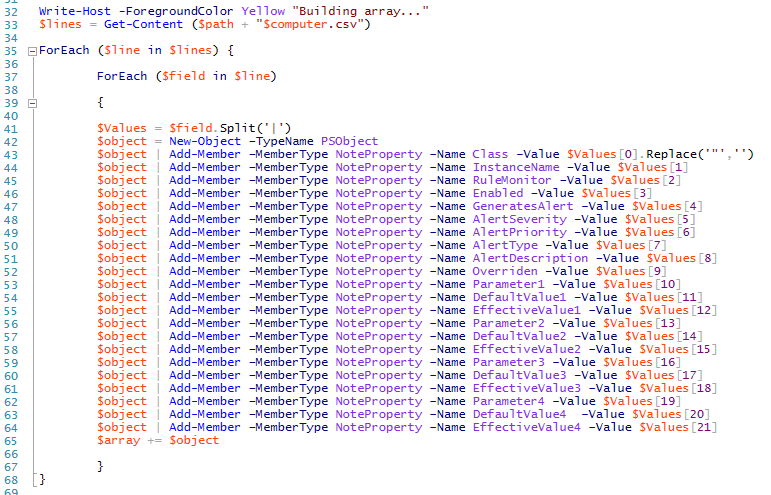 Using powershell query, Can I get the management pack list for an agent which are actually applied on the host ? First, you aren’t seeing any Rules in Health Explorer, only Monitors. Well, the MP’s are downloaded to the machine / agent itself, you can find the directory here \server01c$Program FilesMicrosoft Monitoring AgentAgentHealth Service StateManagement Packs (http://stefanroth.net/2014/01/03/scom-2012-r2-powershell-to-determine-agent-required-disk-space/). Hi..thanks for the answer. When I checked the list of management packs ‘effective’ on a host, it is very few in number. (Checked it from Healthexplorer->Monitor->Properties->MP name). List for a sample server is given below. But when I check the list of MPs downloaded on the host (from \serverc$Program FilesMicrosoft Monitoring AgentAgentHealth Service StateManagement Packs) list is huge and I can’t find many in health explorer as effective monitoring configuration. ‘Export-SCOMEffectiveMonitoringConfiguration’ cmdlet shows the list of monitors/rules and details along with description, but management pack name corresponding to these monitors/ruls is missing in report. So what I’m looking here is to get the list of ‘effective’ management pack names which are configured on hosts.Since this information is needed for some analysis on 100s of servers, checking if any powershell queries are available. Suggestions in this matter will be helpful. Many thanks. Really glad to see your new article on this with helpful suggestions. Thanks a ton for the effort. Not all management packs contain monitors and/or rules so the list of MPs won’t be directly proportional to the number of monitors that you might see in Health Explorer. So… keep that in mind. This is a great script, I haven’t found anything else that will show me all the rules, monitors AND overrides applied to a computer in a single view. First I want to say, Great script Stefan, as always! I learn something new every time I visit your site. Hope this helps. If anyone has any suggestions for improvement, please speak up. Also, Stefan, have you tested this with an ArrayList for the $array variable? I’m curious if there could be performance gains. The script doesn’t give all the filesystems which are getting monitored, it just displays the first FS when we pull the effective configuration..any suggestions on how can we fix this..